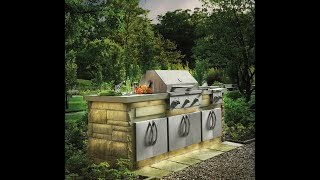 A properly equipped outdoor kitchen generally operates separately from your home's regular kitchen space, allowing the two areas to be utilized entirely independently from one another. When well designed, an outdoor kitchen functions most effectively when it's zoned into logical uses. This means your cooking area should have plenty of prep space, room to set down utensils and stage ingredients, and a comfortable buffer from the seating island to keep guests protected from the heat. There are countless ways to achieve this goal either with a custom built barbecue or outdoor kitchen...or by way of a prefabricated barbecue unit installed to look like a custom build. Landmark Pavers has designed, constructed and installed a wide array of outdoor BBQ island configurations. Request a Quote today to get us started on your outdoor culinary space!